This summary is the second in a series of five short documents based on a literature review published in 2011. In what follows, we first present the mechanisms of action underlying traffic-calming strategies, as these mechanisms help to explain and predict the effects of calming interventions on air pollution produced by traffic. 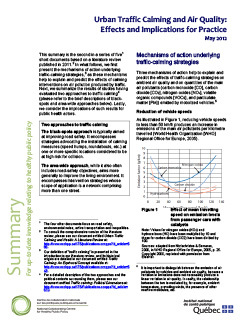 Next, we summarize the results of studies having evaluated two approaches to traffic calming. Lastly, we consider the implications of such results for public health actors.